There's a great Russian Cafe & Deli in Campbell. The deli section has a meat counter with some awesome meats. 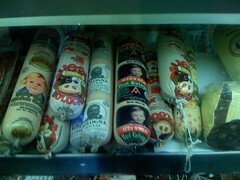 And some meats with pictures of kids on the packaging. Am I the only one to find this kinda creepy?